Kelly grew up in Omaha, Nebraska. He was born to Gene and Mary Poling. He is one of 3 children. While growing up, he definitely showed a propensity toward sports. Drawing also came very easy to him. This was evidenced by a watercolor he painted in the 2nd grade which was chosen to hang at the Jocelyn Art Museum. In high school he played basketball in which he played on the state championship team in 1979. But his heart and soul was baseball. He played for the American Legion in Omaha during high school. He graduated in 1979 from Omaha Northwest. He chose to go to Hutchison Jr. College on an athletic scholarship even though the Kansas City Royals offered him a tryout. He played for Hutchinson for one semester before transferring to Fayetteville, Ark on an athletic scholarship where he played as a Razorback. Unfortunately, 1980 proved to be a challenging year. While playing American Legion ball in the Regional Tournament in St. Louis, he badly injured his Rotator and his baseball career was over. He transferred back to Nebraska where he finished his academic work at the University of Nebraska. While at University of Nebraska he studied under one of his favorite teachers, Keith Jacobshagen. It was through him, that his love for art was reignited. He graduated with his Bachelors of Fine Arts degree in 1985. After graduation he spent time on odd jobs until he was hired as the in house artist at a restaurant named Brittany’s in Lincoln. At this restaurant he found much enjoyment in cooking. After Brittany's, he bought ownership into a restaurant for approximately 2 years. After this time period he decided to sell his shares and move to Las Vegas to try his hand at his art again. A year had passed with no success in the business and he had decided to move to LA. Prior to moving, he received an offer and accepted, to commission 10 pieces for Palace Station Casino, which emphasized his love of the railroad, and then later, 10 pieces for MGM. After a time, the work in Las Vegas wasn’t there and he accepted an offer from his father to move to SW Missouri where he tended his father’s ranch and raised cattle for 5 years. In October of 1994, his life changed again, when he met his wife, Angela, of 15 years. After they married in August of 1995, she encouraged him to draw again. In 1997, Angela received a job offer in Chillicothe, Missouri. So Kelly, Angela and their 9 month old son, Gabriel, packed up and moved to Chillicothe, Missouri. In March of 1998, the Poling’s opened up Original Artworks by Kelly. An art gallery that focused on his works and matting and framing. In July of 2000, their daughter, McKenna, was born. One week after her birth, Kelly started his journey of becoming one of the most well known Midwest muralists. 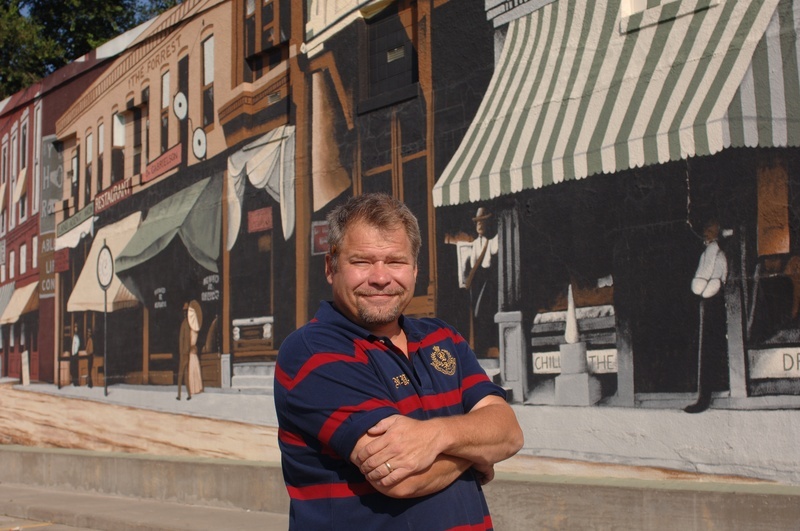 Thanks to strong community support, his artistic skills became so appreciated that the mural requests continued. As of April 2010, Kelly claims 26 murals in all. 18 in Chillicothe alone. He also has murals in Maryville, MO, Excelsior Springs, MO, Bethany, MO, Cuba, MO, Centralia, MO, Bedford, IA and Omaha, NE. Today, he goes to play everyday, thanks to the love of his family and support of his community and the faith in God..